Taste French Soda from DIABOLO! 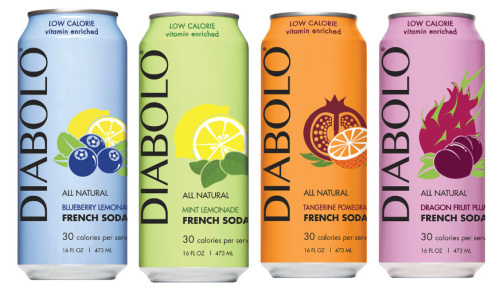 Inspired by the iconic French refreshment “Le Diabolo”, DIABOLO's all natural sparkling refreshments are a unique alternative to regular sodas. Try it in four delicious, exotic flavor combinations: Dragon Fruit Plum, Blueberry Lemonade, Mint Lemonade and Tangerine Pomegranate. There are only 30 calories per serving and 7 grams of sugar per serving. DIABOLO is lightly carbonated, enhanced with B vitamins and has no artificial colours or flavors. You can enjoy it as a guilt-free refreshment, or add to your favorite cocktails! Directions: Open the can & enjoy, or use as a low calorie mixer. This was very tasting and refreshing. I had the blueberry lemonade and would like to try the other flavors. It is better than drinking plain water which is what I usually do. According to the text on the can Diabolo is a French Soda, All Natural, Low Calorie, Vitamin Enriched, and is sweetened with cane sugar, erythritol, and stevia extract. That’s a lot of information for a soda to portray on their label, but Diabolo does so without making it seem ridiculous. In fact the can art is rather peaceful looking, a nice mint green with a simplistic feel. Smell wise the mint overpowers the lemon quite easily. The lemon is back there, but mint has stolen the show easily. I’m curious if this will taste like mouthwash… hopefully not. Diabolo Mint Lemonade is also a rather refreshing soda with little to no syrupy sensation. The mouthfeel is effervescent and enjoyable. These particular flavors need an environment like this to thrive to their fullest and Diabolo has kindly provided that for them. Due to the fact that this is sweetened with stevia I had concern there would be an unpleasant aftertaste. I’m happy to report that this is not at all true. While my mouth does feel a little drier than I would expect after each sip, there is not a terrible taste accompanying it. What I get instead is the tingle of mint and lemon, which is still a somewhat unique combination that works fairly well. I liked this soda because it tasted very fresh and didn't have that artificial sweetener tastes that other flavored sparkling drinks sometimes have. It works well as a mixer or on its own taste good with a tiny splash of juice added as well.